I know it's kind of lazy to review series together like this, but I read each of these right in a row (one a day because they were such quick reads) and decided it was easier to do it this way. The fourth and final book, The Heir comes out this year, and I'm excited for that! The Selection begins with America Singer. A girl living in the United States years after the Third and Fourth World Wars. Even after the time when the Chinese took over the states and it was the United States of Asia. They live under the rule of a King in a world with a caste system. The Ones and Twos live as rich and entitled. Threes and Fours are still pretty good, and generally teachers. Fives are artists. Sixes are servants, Sevens and Eights are basically the bane of society—the homeless. The caste system rules their world, their interactions, their lives. America Singer is a Five. She's a talented musician and singer, who is madly in love with Aspen Leger, a Six. Luckily for her, Aspen is madly in love with her too. The only problem is that because he is a Six, it will be complicated and difficult for them to be married, and Aspen is worried about America being demoted a caste just because she loves him. But before they can worry too much about their hopeful wedding plans, Prince Maxon has come of age to marry, and in a show of union between the royals and his people, it is tradition for the Prince to marry one of his citizens through a lengthy process called "The Selection". The selection is voluntary. Women of age fill out an application and through random lottery, 21 are selected to enter the palace for Maxon to get to know and choose from. America enters The Selection ONLY because Aspen wants her to give it a try. Just to say that she tried. And, unfortunately for America, she's selected. If you like the show "The Bachelor" these books are for you. It's exactly the Bachelor! 21 women fighting for the prince's affections. Pretty on the outside, friendly to each other in his presence, and horrible and catty to each other when the Prince isn't around. 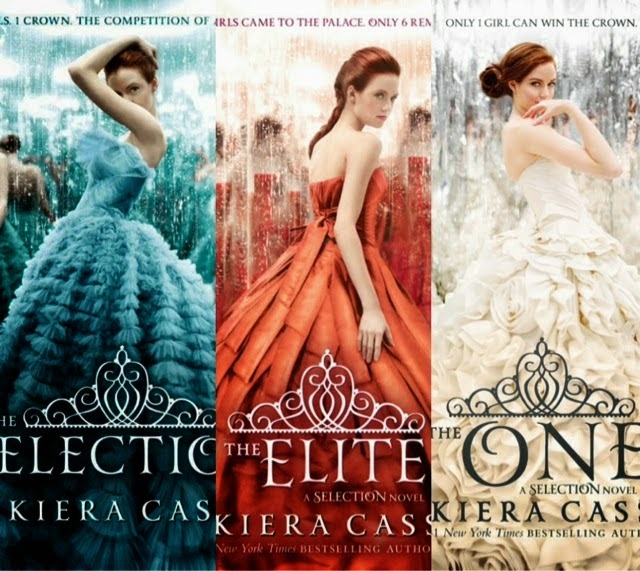 I am not really a fan of the Bachelor, but I still enjoyed these books. Cass develops her characters well, and weaves in a deeper storyline aside from just a bunch of girls trying to win the crown. There are two types of Rebels breaking into the castle. One that takes lives, the other that takes... books? ha. This other part of the story is a nice break from focusing on just the Selection. The first two books in this series are good, (well, the second book was annoying because America was annoying. haha.) but the third book is definitely the best. Cass takes readers on a real emotional journey in the third book. You get all the highs and lows, good and bad feels in the third book. Not to mention that Cass throws in a serious shocker near the end. Even still, everything seems pretty sewn up by the end of the third book, so I'm curious as to what the last book will be about. I definitely recommend this series to anyone looking for an easy, entertaining, well-done read. I really liked how Cass developed her characters and some of them had huge growth and change arcs. I felt like the emotions and reactions of the characters was authentic too, not just some weird fabrication of feelings that often confuse or annoy readers. I decided to pick orange juice for this read, because America has orange juice for breakfast her first morning in the castle and it's a marvel to her. Coming from a poor family with days they had barely enough to eat, she was constantly impressed with richness of the food and the opportunity to have freshly squeezed juice every day!